An artist's conception of the Galileo spacecraft, which was launched in 1989 for a mission to Jupiter. Galileo was the first spacecraft to examine Jupiter and its moons for an extended period. It launched from the payload bay of space shuttle Atlantis in 1989, got some speed boosts by swinging past Earth twice and Venus once, then arrived at Jupiter at last in 1995. Circling the solar system's most giant planet for eight years, Galileo beamed back a string of discoveries to Earth despite encountering several mechanical problems. It discovered evidence of saltwater below the surfaces of three moons – Europa, Ganymede and Callisto – and also got close to the infamous "pizza moon" Io as its volcanoes belched into the atmosphere. When Galileo was almost out of fuel, NASA deliberately sent the spacecraft on a suicide plunge into Jupiter on Sept. 21, 2003. The sacrifice, the agency said, was necessary to protect Europa – which likely has a subsurface ocean that could contain life. Studying Jupiter from Earth is easier than ever thanks to improvements in imaging technology, making it easier for even amateur astronomers to watch Jupiter's weather and periodic cometary impacts. Along with Galileo's data, this is helping professional astronomers gather data on how gas giants change on the scale of a few years, or decades. Still, wider mysteries about Jupiter remain – even as NASA returned to the planet in 2016 with the Juno mission. Some missions are being considered for Jupiter's icy moons in the 2030s, such as NASA's Europa Clipper and the European Space Agency's JUpiter ICy moons Explorer (JUICE). Open questions concerning Jupiter include the global abundance of water in Jupiter, how deep storm features go and where Jupiter's magnetic field comes from. Galileo's work at Jupiter has gained even wider implications in the years afterward, because scientists have discovered thousands of exoplanet candidates. Studying Jupiter in our own solar system gives us a window into the formation of these planets outside of our solar system. It's not clear if the solar system shares all of the same "life history" characteristics of other solar systems. For example, some Jupiter-sized extrasolar planets are very close to their parent star, and as such as are called "hot Jupiters." It's possible these planets migrated, but the processes are poorly understood. Jupiter was a target of interest for NASA for decades before Galileo's launch. Four spacecraft had flown by the giant planet before – Pioneer 10 and Pioneer 11, and Voyager 1 and Voyager 2. NASA was intrigued by the thought of a Jupiter mission, but the idea went through years of budgetary discussions and management changes, as well as machinations in Congress. 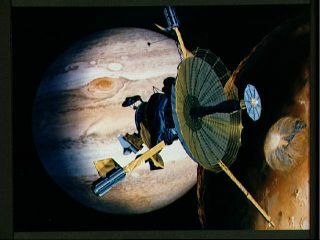 By 1977, NASA was far enough in its planning to propose a "Jupiter orbiting probe" in its budget, but the idea was thrown out by a congressional appropriations subcommittee with oversight of the agency. That decision was reversed after a massive lobbying effort by the scientific community, and Congress approved the project later that year. It would take another 12 years to get Galileo off the ground. There were continual government funding threats to the mission and even the existence of NASA's Jet Propulsion Laboratory, where it was being built. Debates also arose about Galileo's planned launch vehicle. Then, just as the probe was readying for a space shuttle mission, Challenger exploded and killed seven astronauts in 1986, grounding the fleet for two years. Named for astronomer Galileo Galilei, the spacecraft launched at last on Oct. 18, 1989, from the payload bay of space shuttle Atlantis. To save on fuel, the probe whipped by Venus once and Earth twice to pick up speed, with the aim to reach Jupiter in 1995. Operating missions for the long duration can be a marathon for both humans and spacecraft alike. As components on the spacecraft break down, it's up to the people on the ground to figure out how to resurrect them – or do without them. Galileo's most prominent failures were a high-gain antenna that failed to open – threatening the transmissions of data back to Earth – and a data tape recorder that temporarily jammed during the final approach to Jupiter. The sticky antenna, shaped somewhat like an umbrella, lay stowed on the spacecraft for nearly two years after launch. NASA determined it might be risky to set it free when Galileo was closer to the sun during its gravity assist by Venus. On April 11, 1991, controllers sent a command for Galileo to unfurl the antenna. The motors ran for eight minutes at higher power levels than expected, which indicated there might be a problem. The spacecraft then failed to send a signal to Earth saying the antenna had opened. A fault analysis determined that some of the antenna's "ribs" got stuck. Managers did everything from rapidly spinning the spacecraft to exposing the antenna to sunlight, with no luck. To get around the problem, they came up with ways to compress data so that Galileo could send back more information to Earth, which helped save the crippled mission. NASA now relied on Galileo's on-board data recorder and low-gain transmission antennas to bring information back to Earth. That worked well until the recorder jammed for 15 hours while rewinding on Oct. 11, 1995 – just as the spacecraft was finally closing in on Jupiter. Fortunately, NASA found a work-around and was able to resume work a few weeks later. The tape recorder acted up in future years, though, necessitating more fixes. "Among the Galileo mission's memorable achievements were the repeated successes of its staff in solving serious technical problems," wrote Michael Meltzer in the NASA publication Mission to Jupiter: A History of the Galileo Project. "In each instance, the team attacked potentially mission-ending problems and found ingenious ways to keep the spacecraft operational and productive. One of Galileo's first science targets was Comet Shoemaker-Levy 9. Jupiter's gravity had pulled the comet towards the planet and broken it up into more than 20 pieces. When the shards slammed into Jupiter in July 1994, the astronomical community eagerly watched. Galileo was en route to Jupiter at that time and snapped some shots of the hits. The spacecraft encountered "interplanetary dust storms" on its way to Jupiter, possibly from particles coming from within the Jovian system. At one point, Galileo was tracking 20,000 dust particles a day, compared to a typical one particle every three days. Galileo was still flying at Jupiter when in July 1995, it released a probe to smack the planet's atmosphere in December. When the probe finished its descent, NASA was surprised at its measurements of helium – half of what they expected – and the dryness of the region in which the probe flew. "These initial findings are encouraging scientists to rethink their theories of Jupiter's formation and the nature of planetary evolution processes," wrote NASA in a January 1996 press release. Galileo itself reached Jupiter on Dec. 7, 1995, beginning its years of circling the planet and its moons. These global views of Jupiter's icy moon Europa were captured by NASA's Galileo spacecraft in June 1997. The image on the left shows Europa in natural color, while the right-side image has enhanced colors to bring out subtle color differences to show differences between pure water ice (white and bluish white) and non-ice components (red, brown and yellow spots). In the early days, Galileo took a close look at the faint rings of Jupiter to find out how they formed. Data from the spacecraft determined that meteoroids, crashing into small moons around Jupiter, were sending dust up around the planet. Over time, the dust coalesced into rings. While Galileo was often called a mission to Jupiter, the spacecraft also made extensive observations of the planet's largest moons. It found evidence of a liquid ocean underneath Europa's surface, sparking questions about what sort of life could lie underneath. From watching volcanoes at Io, Galileo's data showed the moon's volcanic activity could be as much as 100 times more than what is seen on Earth. And at Ganymede, Galileo found the first magnetic field around a moon. Galileo even made a few side discoveries. When taking pictures of the asteroid Ida, it discovered there was a smaller object orbiting around it. Later called Dactyl, this was the first confirmed satellite of an asteroid. In 2003, the aging spacecraft – battling radiation problems and other mechanical issues – was running low on fuel. NASA chose to send Galileo straight into Jupiter rather than leave it in orbit, just in case the spacecraft accidentally crashed into Europa and disrupted possible life there. Galileo broke up in Jupiter's atmosphere on Sept. 21, 2003.